G o t o L a n d s c a p e O n l i n e . c o m a n d s e a r c h J o n a t h a n A l d e r s o n t o v i e w m o r e f i r m p h o t o s 132 Landscape Architect and Specifier News Jonathan Alderson Landscape Architects, Inc. Wayne, Pennsylvania Reading Hospital Expansion, Reading, Pa. 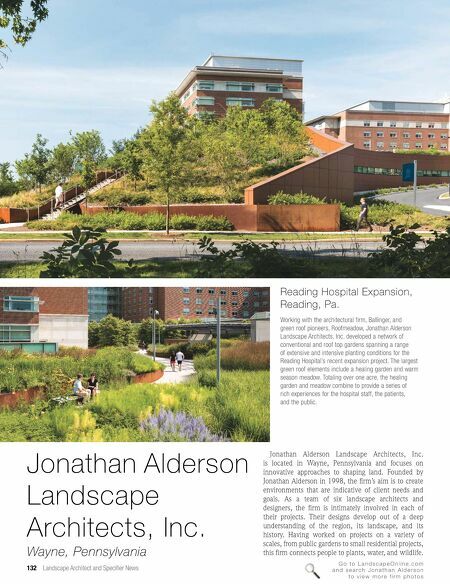 Working with the architectural firm, Ballinger, and green roof pioneers, Roofmeadow, Jonathan Alderson Landscape Architects, Inc. developed a network of conventional and roof top gardens spanning a range of extensive and intensive planting conditions for the Reading Hospital's recent expansion project. The largest green roof elements include a healing garden and warm season meadow. 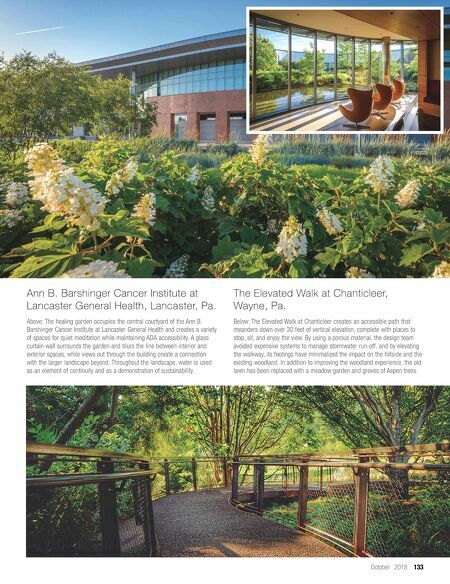 Totaling over one acre, the healing garden and meadow combine to provide a series of rich experiences for the hospital staff, the patients, and the public. Jonathan Alderson Landscape Architects, Inc. is located in Wayne, Pennsylvania and focuses on innovative approaches to shaping land. Founded by Jonathan Alderson in 1998, the firm's aim is to create environments that are indicative of client needs and goals. As a team of six landscape architects and designers, the firm is intimately involved in each of their projects. Their designs develop out of a deep understanding of the region, its landscape, and its history. Having worked on projects on a variety of scales, from public gardens to small residential projects, this firm connects people to plants, water, and wildlife.